Note: For more information on cancelling, click here. Back in April, I began my attempt to cancel my voter registration. I followed the instructions of the kind government employee and waited for proof of cancellation to come in the mail for a few weeks. I then went back when I was summoned to serve on a jury, and she said they weren’t going to send anything and they didn’t have anything they could give me for proof. Well, me being the person I am, I wanted something to frame and put up in my sorry for an excuse of a studio, and also proof that it really does work. So today, during my adventure of observing a criminal court proceeding, I trundled on down to the Government Center in Downtown Bloomington and tried a third time. 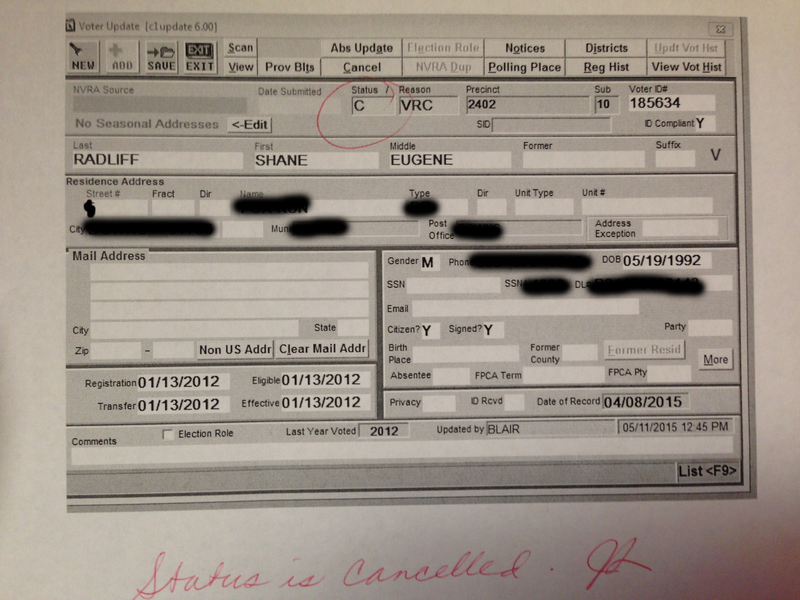 This visit provided me a different government employee and she actually provided me proof of my “cancelled” status. Even in the Communist State of Illinois, it’s rather easy to cancel your voter registration; now, getting them to provide proof may take a few trips, but is still very much worth it in my opinion. The redacted document is below. Can you send a draft of the letter that you submitted to have your name removed from the voter information portal? It’s been so long since I did mine, I don’t have the letter anymore. That said, I do have one that a listener in Michigan sent in (http://www.libertyunderattack.com/wp-content/uploads/Documents/josh's%20letter.jpg). If you follow his example and get it to your local voting “authority,” it should work like a charm!